I really wasn’t planning on blogging this ride. After all, I’d already blogged one (or is it two now?) river loops this year before adding this one. How many times can someone blog the SAME route? Well, every time some little detail catches my attention that I want to not only share, but keep in my own memory. Loke and I both felt our 19 mile ride on April 6th more than I thought we would. I had a migrane all day yesterday and Loke barely moved out of his bed until around 1 pm. He had a good appetite and such, but he really wanted to sleep lots. We both felt much better this morning and it was quite warm though with a dull gray overcast. Around 11 am the skies cleared and knowing we have a bunch of rain on the way, I decided we’d go for a short ride. Just the river loop with the extention and maybe the field loop section stuck on. Though the ground was old and familiar, it still felt good to get out. I discovered quite quickly there was a good stiff breeze coming across the fields. Still, not being in any hurry, I didn’t pay much attention to my speed and just kept the pedals going round at whatever speed and force my knees would allow and enjoyed the day. Loke and I had made the turn down the extention path running parallel to the river in the upstream direction when I somehow spotted something on the flattened grass between the path edge and the drop of the bank to the water. It was a rodent of some kind. It had an almost black body with a paler belly and was simply sitting crouched in the sun. I almost wondered if it was dead when I stopped for a closer look, but it perked up warily when I stopped. Unfortunately, it didn’t sit still as I started digging for my camera. Quick as a flash, it vanished in the taller, dried stalks down the slope of the bank. I’m not sure, but I think it was some kind of vole or lemming, since it had a much rounder, cuter look to it than a rat. It’s face was shaped kinda like a dwarf hamster’s, though it was about 3 times the size of those and with a furred longish tail. Still, I thought it was neat to see and it decided me to blog the route. 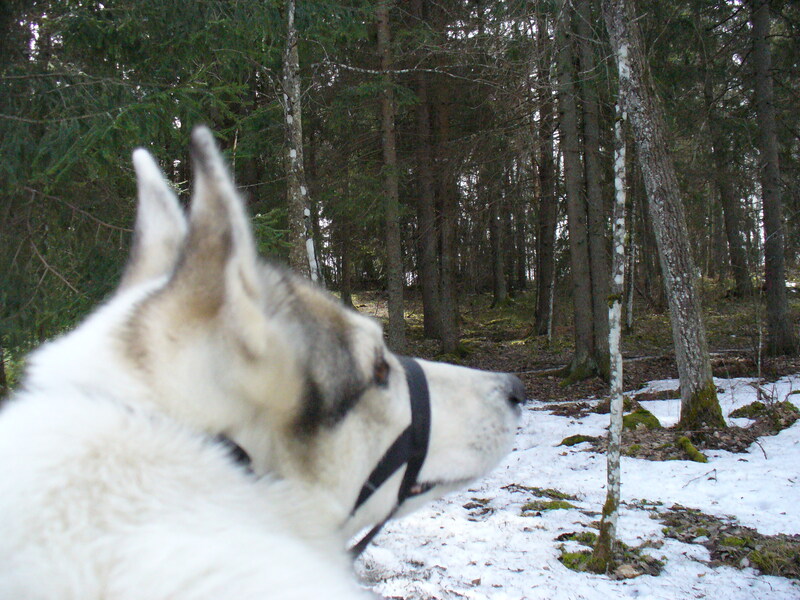 I did the out and back of the extention and where Loke and I usually turn to finish the river loop, I went straight. It’s along a fairly busy road with business/industrial clutter along it, but still the easiest way to get to the field loop. We went between a pair of fields before heading under the 55. There’s a cluster of garden plots out there near the observatory and with the sunny warm weather, it was busy. The cycle/foot path across the fields was fairly dry and virtually clear, except for one spot. The unpaved path meets up with a paved one that takes a sharp left and I think all the snow from the paved one was just kinda pushed across the unpaved when they plowed it. I got stuck. My rear tire had no traction, Loke couldn’t get any grip on the slush and ice to help and I was on an upslope making it very difficult to not roll back while attempting to get out of my seat. Fortunately, a very nice guy suddenly ran up and grabbed the other side of Loke’s running bar to hold the trike still while I got up. Another one of those warm fuzzy moments that reinstills one’s faith in humanity. I pulled the trike out of the slush and gravel to a spot I knew I could get traction on, thanked the guy and went on my way up the wooded hill. This hill probably only covers a few acres and sits surrounded by fields. A little island of trees, shadows, ferns and mossy rocks. And at this time of the year, snow determinedly holding on. I’ve always been fond of this spot. Mostly because I like trees, rocks and ferns. Loke I think really like the LONG slope on the other side of it he gets to charge down at break neck speed. Though, he wimped out a bit on this run, hitting only 14.5 mph instead of 17-20 mph he did last year. 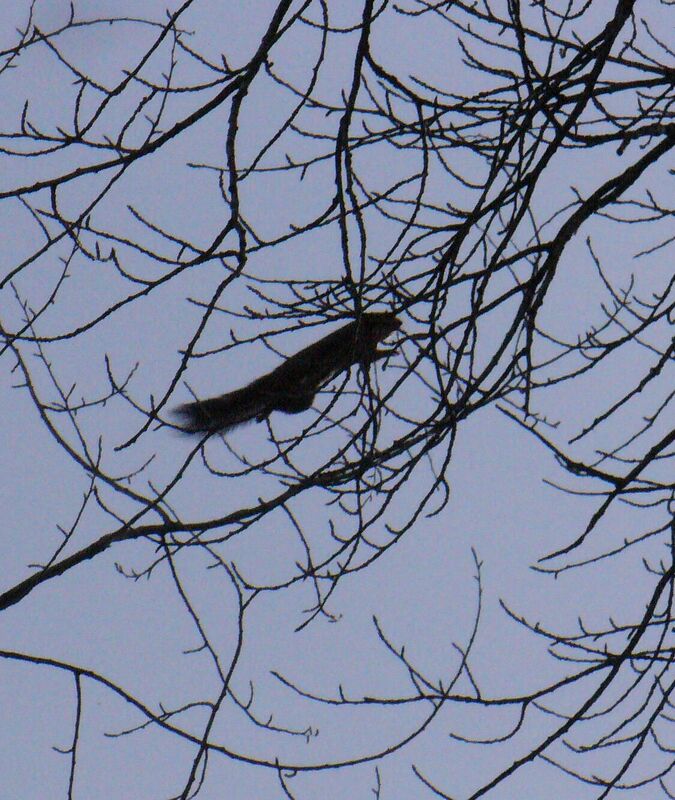 As I took pictures of the trees, I heard something on the other side and looked up. It’s not often one gets to see one of Sweden’s little red squirrels. I’ve lived here for a bit over 5 years now and I’m certain I’ve seen less than 20 of them. They’re fairly elusive and in far less concentrations than gray squirrels in the southern part of the US. Some places in Mobile, AL probably have 20 grays per 100 square meters. There are also black ones, which might just be the same species, but a different color phase. I’ve seen about dozen of those, but always at the Skansen zoo/cultural park in Stockholm. Even so! This is the first time I got a picture of either kind and it was hard to get the little guy in frame and click before he’d jumped to the next branch. Was rather proud of myself that I caught him in mid-leap. Loke: "I could get him if it wasn't for the trike!" Loke’s attention, of course, was riveted. He’s mostly given up on birds, unless of course, they’re trying to hide in a hedge instead of taking off. Squirrels do something else to his brain. I think he recognizes they don’t have wings, so it’s almost like he believes if a squirrel can get up there, then so can he. The first time he saw one, it was a good 10 yards up in the branches and Loke was setting himself up to leap straight up as if he honestly could jump that high. It was funny. I have such a silly husky, but I love him. I was a bit worried about the path down the other side of the hill. It used to be very bad and I expected it to be even worse after this winter with the country roads being any indication. It was fine until we passed back under the 55. 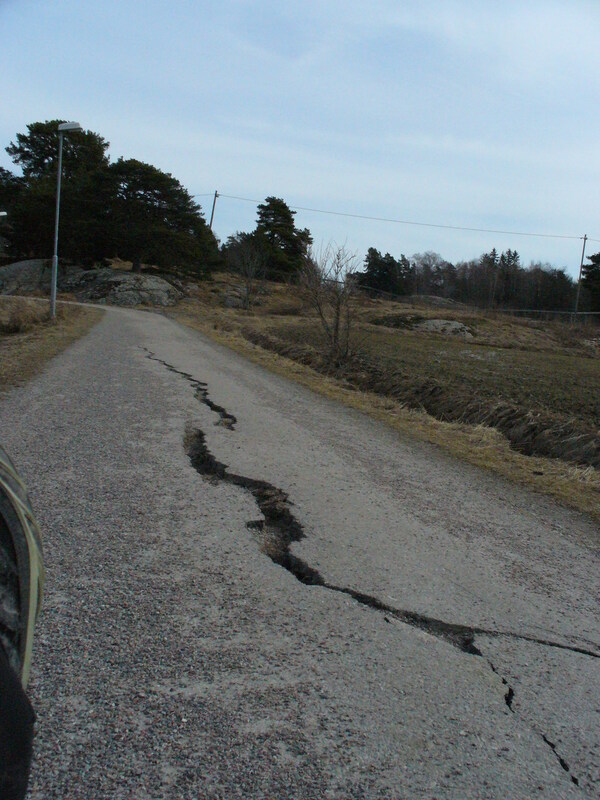 Then there were a series of the fissures along the sides and down the middle. Makes it a bit trickier on a cycle/foot path to avoid them as there’s not as much room. Loke is generally smart enough to not step in them, but I know how easily distracted he can be and there as a dog running loose in the field next to us. It was a slight up-hill climb, dodging the cracks before we made the turn onto the path running between the edge of the field and the bottom of a treed hill of a small parkland. I’ve always loved that section of path. It’s on a slight downhill and nice smooth earth that is kind to Loke’s paws so we usually take it fast. Not a wise thing this time. There were a couple of ruts from spring melt which gave me nasty jolts. I think Loke was a bit disappointed we couldn’t take it as fast as we usually do. As we were heading back to pick up the last part of the river loop, I was coming up to an apartment as a women was just coming out of the building with her dog. I was perhaps 50 yards away or so. As soon as she saw me, she abruptly turned and rushed back to the door. She didn’t go back in, but instead, firmly blocked the dog between herself and the wall with her long coat hiding the dog’s head so he didn’t see us go by. It struck me, how sad it was her pet must have been so dog agressive she felt the need to do that. I made the turn back toward the river and I spotted something that surprised me, along the half-mile or less stretch of path between one road the the path along the river was a small cluster of memorial items. A framed photo, candles, flowers (fresh and wilted). Loke was running so I didn’t get to stop for a closer look, but the photo was of a bearded man in his late thirties or early forties. It was rather chilling in a way, wondering how on earth had he died there? Was it violence? Or another of those wierd deaths that we’ve had in Uppsala so far? The woman who froze to death at the grave mounds. The dead man they found in the river who they believe fell in at the beginning of the freeze only to be found after the thaw. Can Still See The Table Tops! Then it was the home stretch along the river. 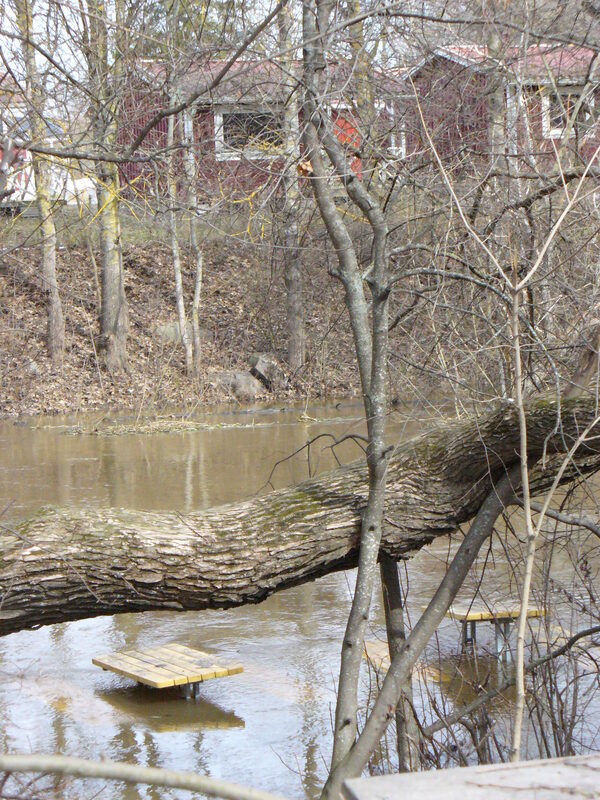 I’d noticed on the river loop extention how high the water was. It’s usually smooth, glassy black surface was a muddy kind of brown and not reflective at all as the current marred it with small ripples for the entire length. I thought it was the highest I’d ever seen it. I realized that impression was wrong when I passed by this one spot that has always had picnic tables down by the water’s edge. Well, usually they’re BY the water’s edge and not IN the water, but during the spring especially they’re unusable. They’re even chained to the trees to keep them from being swept away. With the tops still a good foot above the water’s surface, I knew it wasn’t quite as bad as I’d thought. Twice, I’ve ridden by here and the tables’ tops were a good 6 inches or more under water. As I came up to the bridge leading over the river to the swim hall, I spoted someone with a video camera. Guess who they were filming? *sigh* Well, I don’t think I’ve ended up on You Tube… yet. A few minutes later we were home with my Garmin saying we had gone about 8.7 miles. Loke is remarkably flat and every now and again, he gives a long groaning stretch without getting up. I feel pretty good, but I think it was better to have kept this trip short after how wiped we were from Tuesday’s ride. Maybe this weekend, I’ll get my husband to drive me out into the country side somewhere for a proper ride to make a more interesting blog! !